I love this pie. It’s a hearty marriage of delicious veg, slow-cooked tender brisket and buttery, flaky pastry, resulting in a rich, soul-warming pie plate of goodness. And frankly, any thing with Guinness is good and good for ya. 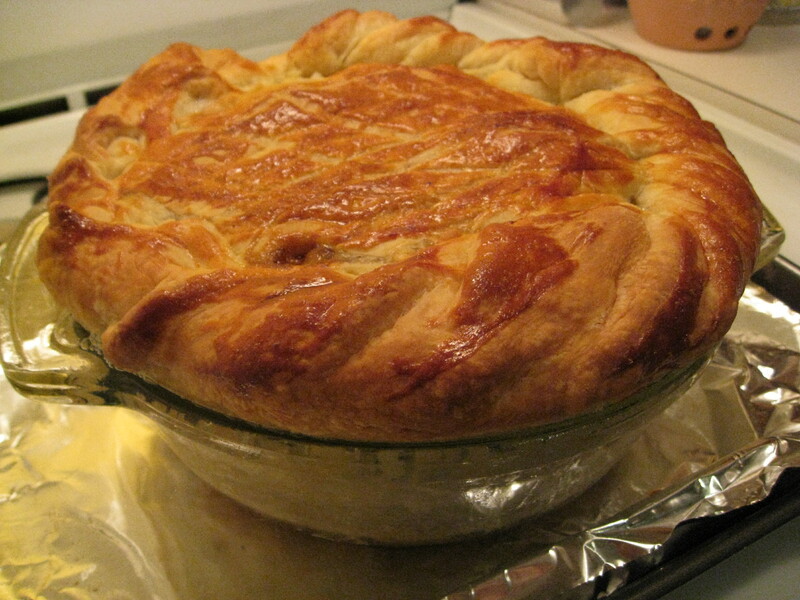 So if you’re looking for a little inspiration to channel your inner-Irish for ♣ St. Patrick’s day ♣, look no further, your luck has led you to this perfect pie. Preheat oven to 375 degrees F. In a large dutch oven on the stove, heat olive oil on low heat. Add the onions until they become translucent and lightly caramelized. Turn the heat to high and add the rest of the vegetables (except peas) with the butter. Cook for two minutes until fragrant, then add the beef, herbs, salt and pepper. 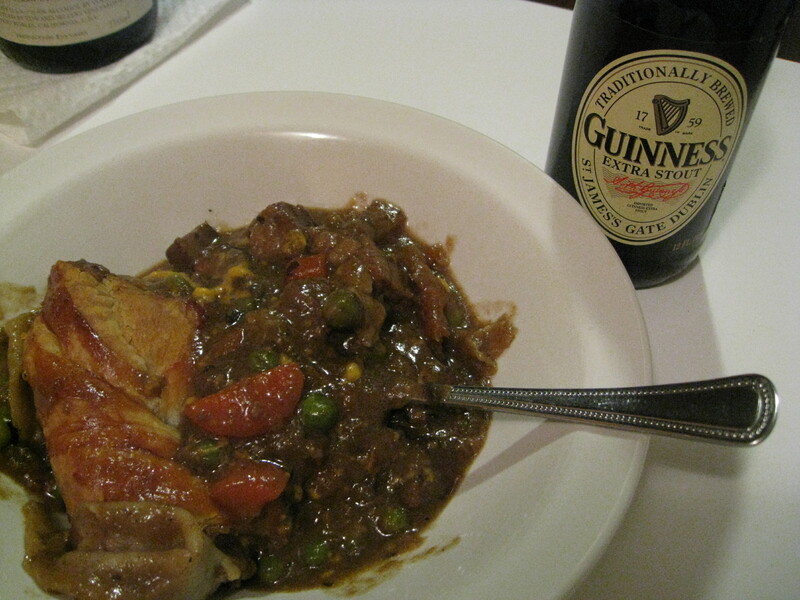 Sear beef for 3-4 minutes, then pour in the Guinness, flour and add just enough water to cover. Bring to a simmer, cover the pan with a lid and place in the preheated over for 1.5 hours. Give the stew a stir and let cook for another hour, until tender and thick. If stew is still liquidy after an hour, continue cooking until reduced. Cut 1/3 of the pastry from the block. Using a floured surface, roll both pieces out evenly with a floured rolling pin to the thickness of a silver dollar. Butter a pie dish, then line with the larger sheet, leaving the edges hanging over the side. Pour the stew into your lined dish, add the peas, then sprinkle over the remaining cheese. Brush the edges of the pastry with a little beaten egg. Brush the top with beaten egg, then bake the pie on the lowest oven rack for 45 minutes, until pastry is cooked and golden. Have been looking for the recipe that I had enjoyed in AU a few years back and this seems to be the closest. Thank you so very much! Excited to see veggies in this one. It really is delicious! I added the peas — not part of the original recipe, but adds a fantastic sweetness. Let me know if you make it and how it turns out. Good luck! I’m going to try this with mushrooms to make it vegetarian. Sounds delicious. You can probably cook in a LOT less time since you don’t have to slow cook the meat. Just cook until the veg are tender and the sauce is thick and then move on to the pastry stage. Let me know how it turns out and how long you end up cooking each step!